Each year, in our FOSS Insects Unit, we raise butterflies in our science classroom. It is always an amazingly wonderful experience for the students to watch the Painted Lady Larva transform from larva...to pupa...and then to an adult butterfly! This lesson helps students learn about life cycles as they observe a metamorphosis, bringing them closer to nature and the common standards that we must cover during a given school year. We tie picture books with writing activities...add in some science inquiry...and maybe a little math graphing. Whoa-la...we have integration! At a recent conference, many of the teachers received a life cycle of a mosquito and life cycle of a worm freebie. I heard several winners say, "what am I going to do with that?" Changes (whether caused by nature or by humans) may effect the other parts of a system. How can we use models to describe that organisms have unique and diverse life cycles, but all have in common birth, growth, reproduction, and death? How can we analyze and interpret data to provide evidence that plants and animals have traits inherited from parents and that variations of these traits exist in groups of similar organisms? How does one's environment influence these traits? How do an animals traits help them survive, find a mate, and reproduce? 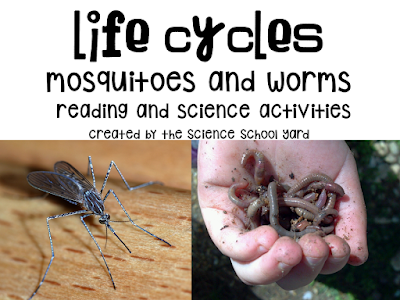 By bringing in worms or mosquito larvae can students learn about the needs of living things? By starting a worm bin and learning about composting, or by looking outside for examples of stagnant water, can students learn about an animals' environment and how they survive? Can students learn to observe, measure, chart, graph, and record with drawings, writing, and interpreting data though a life cycles lessons? Can students learn about the hazards facing us or an animal? 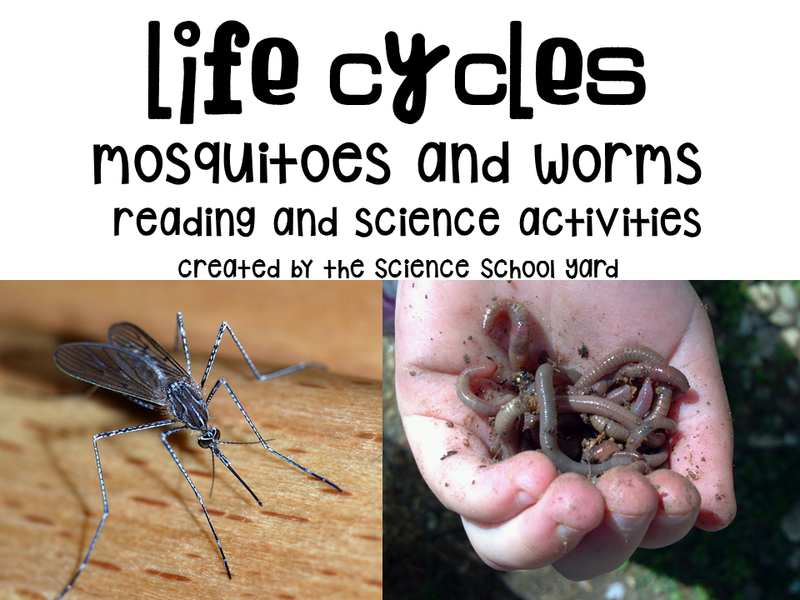 Whether it be NGSS or TEKS...state standards or your district's standards, life cycles are the core ideas of each and every standards based curriculum at one point in K-5. One of the latest classes that I took this summer to help me develop as a science educator was using the book Inquire Within. Inquiry based science is student-centered in approach. Set out the plastic life cycle pieces and see where the inquiry takes you. Let students lead the discussion. Bring in samples and show them what you have. Start with an I wonder...see where the process takes you! 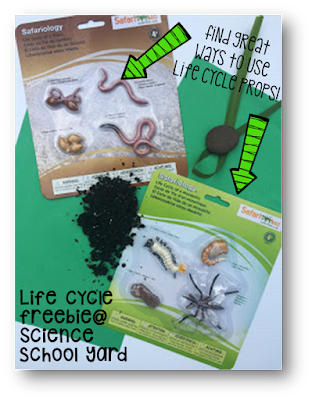 We are always seeking to motivate students what better way than to use life cycles tools and real animals to get them excited and enhance learning for all different learning styles. Life cycles may be our students first experience with biology! By having students identify different species students are able to see the process that living things take and learn to appreciate different animals. In the spring, we study insects. You can take a look at my Insect pack HERE. I mean all different insects and their life cycles...crickets...darkling beetles...ladybugs...butterflies...bees...I even get pond water with tadpole eggs to compare different animals. (Lenard the Frog was just released this week after taking him home and watching him through his changes!) From there my friends...bring out some seeds and grow! Another spring board to watching a life cycle, but this time plants! For those of you checking out my blog this pack is free here! Enjoy! I've had worm bins in the classroom before, and the kids are so amazed. Thank you for the fabulous freebie!